The activities and accomplishments of Chillicothe FFA members were highlighted during the 2009 Chillicothe FFA awards banquet and ceremony at Gary Dickinson Performing Arts Center Thursday night. Approximately $16,000 in awards and scholarships were presented to FFA members during the awards ceremony and four community supporters received Honorary FFA memberships. The top awards of the evening — the Jerry Litton Memorial Scholarships — were presented to Jaimie Baker in the amount of $2,500, and to Tyler Dietzschold in the amount of $1,500. The Jerry Litton Memorial Scholarship was started by Mr. and Mrs. Charley Litton in 1979 in memory of their son, Jerry, and is sponsored each year by the Jerry Litton Memorial Family Foundation. The award is presented to a graduating senior who shows evidence of strong leadership potential as demonstrated in FFA, school and community activities and plans to continue their formal education. Traditionally, just one award in the amount of $1,500 is presented; however, this year two were presented. Foundation vice president Ed Turner presented the awards. A new award was introduced Thursday night in memory of Jackie Skipper, who died in December 2008 shortly after her 29th birthday. Skipper was a community supporter of FFA and was a member of the organization while in high school. Family and friends presented the award which was a $500 scholarship to Angela Quick. The award is to be given annually to a graduating senior in the FFA chapter who shows evidence of strong leadership potential as demonstrated in FFA, school, exhibiting livestock and community activities, and plans to continue his or her formal education. Another new scholarship this year was the BTC Bank Leadership Award to be presented annually to a senior FFA member. Winners are selected on their four-year performance in leadership and service to FFA, school and community. This award is a trophy and a $400 check. The award was presented to Meredith Jones. Thursday's awards assembly marked the 25th year that the Jay Banhart Award has been presented to a Parliamentary Procedure Team member who exhibits outstanding leadership and effort. In memory of Banhart, who was a FFA member when he died in an automobile accident in 1984, the Jay Banhart Memorial Award - consisting of a check in the amount of $1,000 - was presented to a deserving sophomore, junior or senior based on their activities, career endeavors and need. The award was presented to Trevor Meyers. 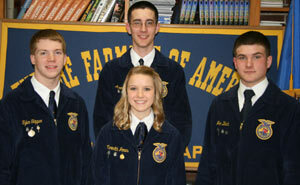 Four FFA members were awarded the Jerry Litton Memorial Leadership Award. Recipients are Clayton Allen, Lauren Melte, Baillie Schneiders and Tyler Skipper. The Jerry Litton Memorial Leadership Awards are sponsored by Chillicothe Youth Agri-Leaders, Trans Ova Genetics, United Country Graham Agency (Dan R. Graham, broker), Chillicothe FFA Alumni and Josh Quinn Memorial sponsored by DQ Precision Planting and Tillage (George and Marta Quinn and Doug and Barb Doughty). Each recipient receives $660 to pay the expenses of four officers to the Washington, D.C., Leadership Conference. The winners' names will be engraved on a plaque and they will represent the chapter at a week-long leadership conference in Washington, D.C., during the summer. Jon Black won the Missouri Alumni Washington Leadership Conference Scholarship, $300. The Rusty and Karie Black Litton Award was presented to Tyler Jeschke. This award in the amount of $500 is presented to a graduating senior in the Chillicothe Chapter in honor of Rusty and Karie Black. The recipient must show evidence of strong leadership potential as demonstrated in FFA, school and community activities. The FFA member receiving this award has exhibited dedication to the Chillicothe FFA Chapter throughout their four years of membership. Litton Livestock Awards were presented to Maycee Hoover, Lauren Melte and Carrie Boon. This award is given to students who keep livestock at the Litton Agri-Science Learning Center as a component of their SAE project. Winners are selected by their ability to care and manage their livestock along with work ethic, responsibility and showing. The award consists of $75 and is sponsored by the Jerry Litton Memorial Family Foundation. Four community members were inducted as honorary members in the Chillicothe FFA during the annual banquet. Honorary membership is given to farmers, school superintendents, principals, members of boards of education, chapter advisors, teachers, staff members in ag education and the FFA who have rendered outstanding service by a majority vote of the members present at any regular meeting or convention. This year's inductees are Butch Rardon, Piggly Wiggly, and Charles and Sherry Jones. The evening began with a meal served to 510 people in the Chillicothe High School Commons and the program involved the recognition of 150 FFA members. 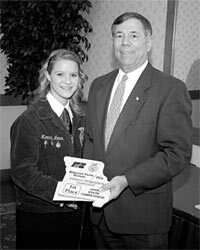 CAPTION: The 2009 Chillicothe FFA Banquet included a dinner for more than 500 people and an awards program at which approximately $16,000 were presented to FFA members. The Chillicothe FFA sent nine individuals to the State FFA Trapshoot on April 25, 2009 in Linn Creek, MO. The event was held at the Missouri Trapshooters Association complex. 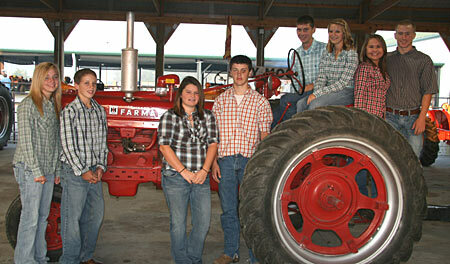 Those participating were front row: Brooke Westcott, Kyle Ulmer, Clayton Allen, Anna Luetticke, and Daniel Nowland. Back Row: Zach Tate, Kayleb Berry, Austin Cassity, and Nick Koeing. The team placed 1st in Area 2 competition. The team is part of the agricultural education program at Grand River Technical School. We are striving to improve shooting skills as well as self-confidence, personal discipline, sportsmanship and teamwork. This year at the 81st State Convention students participated from Chillicothe, Southwest, and Hale. The Ag Sales team placed 13th with a group II rating, including Jaimie Baker, Trevor Meyers, and Ben Radcliff. The Farm Management team placed 4th, and earned a group I rating. The team included Maddie Anderson, Jacob Caughron, Kellin Ferguson, and Aaron Kerr. The Ag Mechanics team placed 12th with a group I rating, including team members, Zach Colvin, Tyler Dietzschold, Aaron Manning, and Lance Surber. The Livestock team placed 13th, with a group II rating, including Clayton Allen, Jon Black, Lauren Melte, and Tyler Skipper. The Parliamentary Procedure team placed 7th with a group II rating; the team included Cheyenne Bannan (alt) Carrie Boon, John Davis, Lauren Dietzschold, Konner Ferguson, Maycee Hoover, Hannah Meyers (alt), and Ashley Myers. In Public Speaking Meredith Jones placed 3rd in Advanced public speaking, with a group I rating. Quincy BeVelle received a group I rating in Division I public speaking. Caitlin Cramer received a group I in Creed speaking. The individuals that received a group I rating at state competition were: Jon Black – Livestock, Maddie Anderson – Farm Management, Jacob Caughron – Farm Management, Kellin Ferguson – Farm Management, Aaron Kerr – Farm Management, Ben Radcliff – Ag Sales, Jaimie Baker – Ag Sales, and Tyler Dietzschold – Ag Mechanics. Jon Black received a Washington Leadership Conference Scholarship. This scholarship pays $300 of the $660 registration fee for Tyler to attend the Washington Leadership Conference this summer in Washington, DC. Ben Radcliff received a $1000 scholarship from the Missouri Youth in Agriculture committee. This scholarship is based on leadership and exhibiting at the Missouri State Fair. 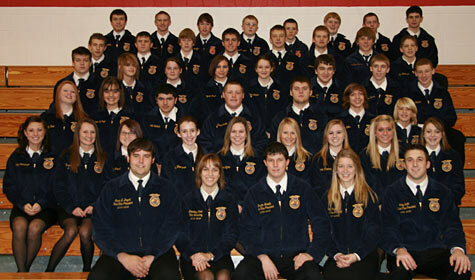 On March 31, 2009 the Chillicothe FFA Chapter participated in the Northwest District FFA Contest. The results are as follows: Parliamentary Procedure, 1st place (state) - Cheyenne Bannan, Carrie Boon, John Davis, Lauren Dietzschold, Konner Ferguson (alt), Maycee Hoover, Hannah Meyers (alt), Ashley Myers; Extemporaneous Speaking 4th place – Kellin Ferguson; Creed Speaking – 2nd place (state) – Caitlin Cramer; Prepared Public Speaking Division I – 2nd place (state) - Quincy BeVelle; Prepared Public Speaking Division II – 4th place – Lauren Dietzschold; Advanced Public Speaking – 1st place (state) – Meredith Jones; Knowledge Team 15th place gold - Hope Peters, Devinn Ashford, Katie Kitchin, Kayla McCollough, Diana Nelson. All members participating at the State FFA contest will be in Columbia on April 16 & 17. 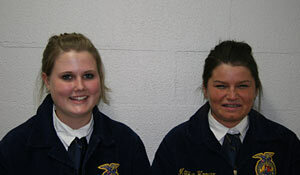 On March 31 and April 1, 2009 the Chillicothe FFA Chapter participated in the Northwest District Ag Contest. The results are as follows: Agriculture Mechanics 3rd place (state)- Zach Colvin, Tyler Dietzschold (2nd high individual), Aaron Manning, Lance Surber; Agriculture Sales 3rd place (state)- Jaimie Baker (5th high individual), Meredith Jones (9th high individual), Trevor Meyers, Ben Radcliff; Agronomy 22nd place - Cassie Reid (10th high individual), Sheldon McDowell, Tyler Wagy; Dairy Foods 18th place - Daniel Nowland, Lara Hopper, Jordan Hall, Taylor Lewis, John Roney; Dairy Cattle 12th place - Kendra Ballantyne, Jordan Campbell (6th high individual), Baillie Schnieders, Brooke Westcott; Entomology 13th place- Ariel Bruce, Conner Cox, Cody Eastman, Katherine Elliott; Farm Management 1st place (state) - Maddie Anderson (tie for 1st high individual), Jacob Caughron, Kellin Ferguson (tie for 1st high individual), Aaron Kerr (7th high individual); Floriculture 29th place- Kelsey Jones, Dani Moore, Mindi Prindle, Trent Putnam, Chris Carr (Alt); Forestry 19th place- Kelton Diggs, Matt Goll, Marie McMahan, Brooklyln Reed, Jesse Riddle (Alt); Horses 17th place- Marc Griffith, Emily Sallee, Alexis Sykes; Livestock 2nd place (state)- Clayton Allen, Jon Black (3rd high individual), Lauren Melte, Tyler Skipper; Meats 8th place - Lance Williams, Tyler Jeschke, Austin Cassity (Alt), Austin Ireland, Cody Thompson; Poultry 15th place- Clark Allen, Emily Venner, Maddie Boyles, Lynzie Colvin; Soils 14th place- Kole Anderson, Maresa Sykes, Haley Thompson, Steven Warren. The teams that qualified will be participating at state contest on April 16th and 17th, in Columbia, MO. The Chillicothe FFA fielded 16 teams and 5 speakers at District Agriculture and FFA Career Development Events on March 31st and April 1st. A total of 70 students competed from the Chillicothe FFA. The career development events were held at Northwest Missouri State University. 325 teams consisting of nearly 1350 students from 49 different schools competed this year. 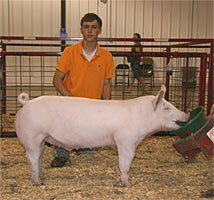 Local FFA members brought home 6 tenth place or higher honors. Two of these were 1st place honors. Chillicothe FFA qualified 4 teams for State FFA Convention. The convention is to be held on the campus of the University of Missouri on April 16 & 17, 2009 in Columbia, MO. The local chapter is part of the Agricultural Education Program at the Grand River Technical School and is composed of students from Bosworth, Chillicothe, Hale, and Southwest high schools. 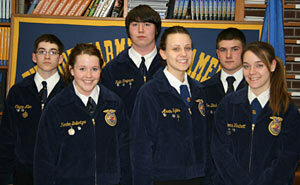 On March 25, 2009, the Chillicothe FFA Chapter participated in the Area II FFA Contest. The speaking results are: Creed Speakers: Mindi Prindle –silver, Caitlin Cramer –2nd and gold; Prepared Public Speaking Division I Speaker: Daniel Nowland - gold, Quincy BeVelle – 2nd and gold; Prepared Public Speaking Division II Speakers: Lauren Dietzschold - 3rd and gold; Advanced Prepared Public Speaking: Meredith Jones-1st and gold; Extemporaneous Speaking: Kellin Ferguson – 1st and gold. FFA books Completed Ownership: Brooklyn Reed-silver; Completed Placement: Marie McMahan-silver; Beginning Ownership: Nick Koenig-gold; Beginning Placement: Devinn Ashford - gold; Scrapbook: Cheyenne Bannan, Carrie Boon, John Davis, Lauren Dietzschold, Konner Ferguson, Maycee Hoover -gold. Parliamentary Procedure team: Cheyenne Bannan, Carrie Boon, John Davis, Lauren Dietzschold, Konner Ferguson (alt), Maycee Hoover, Hannah Meyers (alt), Ashley -1st place and a gold. Those teams and individuals receiving 3rd place or higher will proceed to District competition March 31, 2009. On March 19, 2009, senior FFA members participated in a Senior FFA Trip. Students that had received a participation medal every year while in FFA were eligible to attend the trip. Students attended the World War I Museum, the Liberty Memorial, the Truman Library, and the New Theater Restaurant. 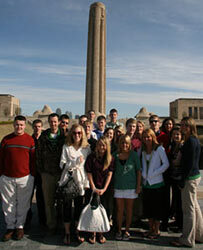 CAPTION: Students are pictured outside the Liberty Memorial. Fourth Row ( L to R): Derrick Scott, Ben Radcliff. Third Row ( L to R): Lance Surber, Tyler Dietzschold, Jacob Caughron, Tyler Jeschke, Jaimie Baker, Angela Quick, Zach Colvin, Lauren Mustain. Second Row ( L to R): Lance Williams, Andrew Thomas, Colton Allen, Maddie Anderson, Steven Johnson, Hannah Walker, Juliane Beck. First Row ( L to R): Hannah Stilwell, Kristen Swartz, Whitney Hoyt, Jenny Summers. Maycee Hoover, Lauren Dietzschold, Mindi Prindle, Caitlin Cramer. On March 16, 2009, the Young Agri-Leaders, formerly Young Farm Wives, hosted a few of the Chillicothe FFA members at the Farm Credit Services Building at their monthly meeting. The individuals that participated were the Parliamentary Procedure team: Cheyenne Bannan, Carrie Boon, John Davis, Lauren Dietzschold, Konner Ferguson (alternate), Maycee Hoover, Hannah Meyers (alternate), and Ashley Myers; Creed Speakers: Caitlin Cramer and Mindi Prindle; Prepared Public Speaking Division II Speaker: Lauren Dietzschold; Prepared Public Speaking Division I Speakers: Quincy BeVelle and Daniel Nowland; Extemporaneous Speaking: Kellin Ferguson. The students presented their speeches and skit to help prepare them to compete at Area contest which will be held March 25, 2009. On March 11, 2009, the Chillicothe FFA Chapter sent two representatives to the Area II officer and state candidate interviews. Jon Black, son of Rusty and Karie Black, was Chillicothe’s representative for an Area II officer. Jon was selected as the Area II FFA President. Meredith Jones, daughter of Charles and Sherry Jones, was Chillicothe’s representative for Area II State Officer Candidate. Meredith was selected as the Area II State Officer. CAPTION: Area and State Officer Candidates. Back (left to right): Clayton Allen, Tyler Skipper, Aaron Kerr, Kellin Ferguson. Front (left to right): Meredith Jones, Alexis Sykes, Amber Kieffer, Jon Black. 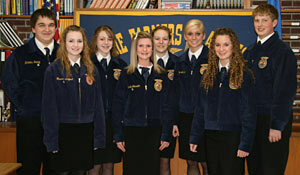 On March 4, 2009 the Chillicothe FFA Chapter held their local speaking contest. The local speaking contest was held in order to determine who the chapter will send to the Area 2 FFA Contest. 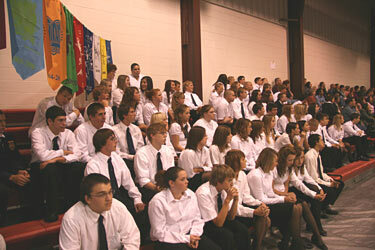 Area contest will be held on March 25, 2009 in Gallatin. Also, we selected the Chillicothe candidates to send to Area and State Officer Interviews. Results are listed below. Back (left to right): Nick Koenig, Caitlin Cramer, Michaela Simmer, Quincy BeVelle, Daniel Nowland. Front (left to right): Devinn Ashford, Marshelle Johnston, Mindi Prindle. CAPTION: Prepared Public Speaking Division II. Pictured (left to right) - Lauren Dietzschold, Maycee Hoover. CAPTION: Extemporaneous Speaking. Back (left to right): Clayton Allen, Kellin Ferguson, Jon Black. Front (left to right): Kendra Ballantyne, Alexis Sykes, Brooke Westcott. CAPTION: Advanced Prepared Public Speaking. Back (left to right): Tyler Skipper, Aaron Kerr, Jon Black. Front (left to right): Meredith Jones. Hot Cakes on a Cold Day - Nearly three dozen Chillicothe FFA students were up early making and serving breakfast to around 125 organization supporters today (Friday) at Mervyn Jenkins Expo Building. Breakfast, consisting of pancakes, bacon, sausage and drinks, was served from 6:30 until 8 a.m. 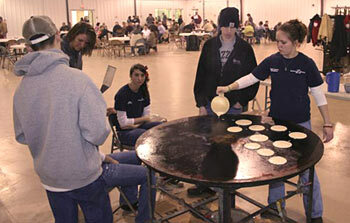 Here, Cheyenne Bannan pours mix for some of the estimated 375 pancakes that were served. 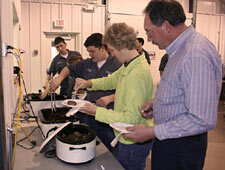 The breakfast is held annually to celebrate the start of National FFA Week, which this year runs from Feb. 21 to Feb. 28. CAPTION: Chillicothe FFA students offer refills on coffee and juice at the breakfast hosted this morning (Friday) at Mervyn Jenkins Expo Building for organization supporters. CAPTION: Chillicothe FFA members and supporters alike line up for breakfast at the Mervyn Jenkins Expo Building this morning (Friday). 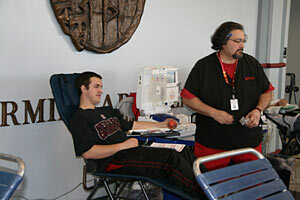 On Friday, February 6, 2009, the FCCLA and FFA sponsored a blood drive for high school students and staff at the Chillicothe High School PAC. The Community Blood Center staff registered 129 volunteers and collected 111 units of blood. There were 85 first time donors. The FCCLA and FFA members assisted the Community Blood Center staff with set-up, registration, passing out treats, and clean-up. The MAFF Public Speaking Contest is designed to develop agricultural leadership, provide for member participation in agricultural public speaking activities, and stimulate interest in leadership and citizenship. Contestants may choose any current subject for their speeches. Which is of an agricultural character relating to county fairs and which is of general interest to the public. 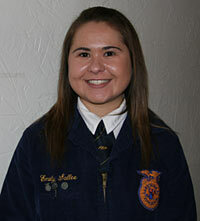 Emily Sallee represented the Livingston County 4-H and FFA Fair at this contest held January 30, 2009. 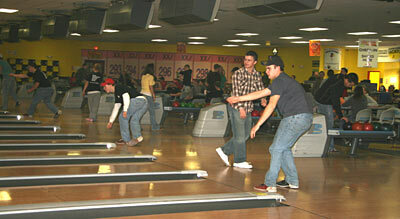 On February 1, 2009, the Chillicothe FFA held their annual Bowling Party at the Fast Lane in Chillicothe. This party represents a reward for members as well as a time for fellowship. There were approximately 100 members present and everyone seemed to enjoy the afternoon. On January 21, 2009 the Chillicothe FFA Chapter held their annual November meeting in cooperation with the Chillicothe High School Hunting and Fishing Club. The meeting was originally scheduled for November, but due to weather issue was held in January. This year students enjoyed bon fire, hot dog roast, food, and a safety program. The Livingston County Conservation Agent, Jacob Strozewski, put on a program for the members regarding the regulations of wildlife and game in Missouri and careers in conservation. 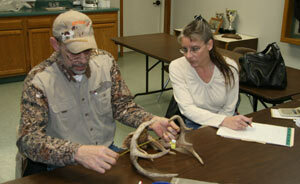 Kyle and Angela Hibner also scored deer and answered questions regarding the scoring and taxidermy. The meeting was held at the Litton Agri-Science Learning Center with approximately 120 members attending. Both pictures are of the Greenhands that attended the Motivational Conference, there are two pictures due to the size of the group. In the front row of each picture is part of the Missouri State FFA Officer Team. Those members are from left to right - Vice President Jacob Bryant, Secretary Beverley Kreul, Vice President Dustin Mareth, Vice President Katie Patterson, and 1st Vice President Cody Smith. CAPTION: Ambassadors and MFB President Charles Kruse. JEFFERSON CITY, Mo. — A panel of judges selected Adam Francis of Norborne and Meredith Jones of Dawn, as 2009 Missouri Farm Bureau Ambassadors during the organization's 94th annual meeting Dec. 7 at Lake of the Ozarks. The Missouri Farm Bureau ambassador program selects a male and female student, 17-22 years of age, to represent agriculture and Farm Bureau for one year. Each Ambassador receives a $1,250 educational scholarship and travel to Washington, D.C., in March on a Farm Bureau legislative trip. Francis and Jones were selected from a field of 17 contestants. Francis represented Carroll County Farm Bureau and is the son of Jim and Cathy Francis. He is a freshman at the University of Missouri-Columbia majoring in agriculture business with a minor in agriculture systems management. Francis is involved in the Ag Econ Club and Collegiate Farm Bureau. He helps when he can on the family farm, Francis Farms, a row crop and beef cattle business that raises more than 1,000 head of beef cattle a year. His family has always been involved in Farm Bureau and are active leaders in Carroll County. Jones is the daughter of Charles and Sherry Jones. She is a senior at Southwest R-I Livingston County High School and is active in many school clubs. Jones is Chillicothe FFA Chapter president, senior class president, and a member of FBLA, FCCLA and FCA. She enjoys basketball, softball and track. When not involved in school activities, Jones helps in the family farm operation which grows wheat, soybeans, corn and cattle. The Jones family has been active in Farm Bureau for many years and Sherry is a past Missouri Farm Bureau board member serving in that position for nine years. During this year's annual meeting Jones also competed against other district finalists to win the Missouri Farm Bureau FFA speech contest. She received $125, a plaque, and presented her winning speech during the evening ambassador program. 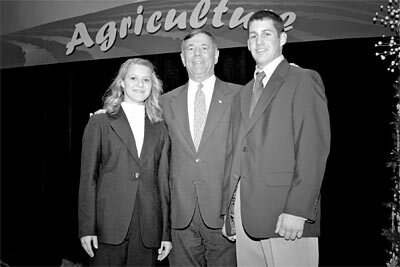 As ambassadors, Francis and Jones will make selected appearances throughout 2009 promoting agriculture on behalf of Missouri Farm Bureau. The contest began Sunday morning as judges evaluated students on a written application and oral interview. During the Sunday evening banquet program, six finalists presented five-minute speeches and extemporaneously responded to a question. The Ambassador program is sponsored by the Missouri Farm Bureau Promotion and Education Committee. Scholarship funds come from the Missouri Farm Bureau Foundation for Agriculture. CAPTION: FFA speech winner Meredith Jones with Mr. Kruse. The Chillicothe FFA held their annual food drive this December. Students collected canned food items for the drive and compiled them at the December FFA Meeting, which was held December 3, 2008. The canned food items were then delivered to the local Salvation Army. The chapter collected ten boxes of food to donate to the Salvation Army. Seniors Tyler Jeschke and Lance Williams delivered the food for the chapter. 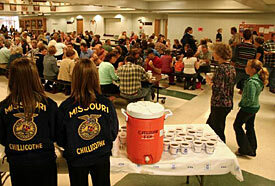 On December 3, 2008, the Chillicothe FFA held their annual Christmas Party at the Chillicothe Middle School. This party represents a reward for members on an excellent Barnwarming this year as well as a time for fellowship. The members enjoyed dinner and then moved into the field house for some games. Members played basketball, dodge ball, volleyball, and had other activities. The students also held a canned food drive and collected 8 boxed of canned food items. There were approximately 150 members present and everyone seemed to enjoy the evening. CAPTION: Back Row L to R -Lauren Dietzschold, Kellin Ferguson; Front Row L to R - Maycee Hoover, Meredith Jones. On November 5, 2008, Chillicothe FFA students participated in the Area 2 Fall Speaking Contest in Gallatin. Meredith Jones competed in the Missouri Farm Bureau Contest, Maycee Hoover competed in the Missouri Pork Producers Contest, Kellin Ferguson competed in the Missouri Institute of Cooperatives Contest, and Lauren Dietzschold competed in the Missouri Sheep Producers Contest. Three of the four members qualified to move on to the district competition. At the Northwest District competition, held on November 19, 2008 in Cameron; Kellin Ferguson received second in Missouri Institute of Cooperatives competition Meredith Jones received first in the Missouri Farm Bureau competition, and Lauren Dietzschold received third in the Missouri Sheep Producers competition. Meredith Jones will move on to the state competition, which will be held on December 7, 2008. The National FFA Organization recently selected from a pool of more than 600 candidates nationwide the CHILLICOTHE FFA CHAPTER as a 3-star winner in the National FFA Chapter Award program. The chapter attended the 81st National FFA Convention in Indianapolis, Indiana, October 22-25, 2008 to accept this award. The National FFA Chapter Award program recognizes FFA chapter for developing and conducting a detailed Program of Activities (POA). Each activity provides opportunities for members to excel in one of three areas: student, chapter or community development. Every year, chapters are recognized as having earned a one-, two-, or three-star rating on their application. Front Row - Alexis Sykes, Lauren Mustain, Konner Ferguson. Almost any event becomes more intriguing when viewed from behind the scenes. The 81st National FFA Convention, which includes everything from arena stage events to the Day of Service and workshops for nearly 50,000 attendees, is no exception. It takes many volunteers to help make a convention of this magnitude a positive experience for all of its guests. This year approximately 900 FFA members, including students from the Chillicothe FFA Chapter, formed the National FFA Courtesy Corps. The students viewed the convention from the other side – backstage – playing a crucial role in the events logistics. Local members participating in the National FFA Courtesy Corps were Jake Meyers, Clayton Allen, Tyler Jeschke, Blake Reed, Alexis Sykes, Lauren Mustain, and Konner Ferguson. 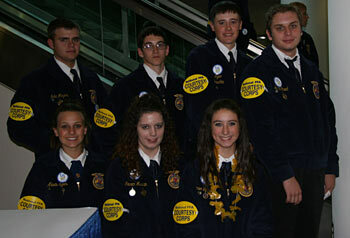 The 81st National FFA Convention was held October 22-25, 2008 in Indianapolis, IN. The National FFA Organization, formerly known as the Future Farmers of America, is a national youth organization of 500,823 student members – all preparing for leadership and careers in the science, business and technology of agriculture – as part of 7,358 local FFA chapters in all 50 states, Puerto Rico and the Virgin Islands. The National FFA Organization changed to its present name in 1988, in recognition of the growth and diversity of agriculture and agricultural education. The FFA mission is to make a positive difference in the lives of students by developing their potential for premier leadership, personal growth and career success through agricultural education. CAPTION: Pictured - Left to Right: Back Row - Jake Meyers, Tyler Jeschke, Lauren Dietzschold; Middle Row - Kelton Diggs, John Davis, Ashley Myers, Clayton Allen, Blake Reed, Konner Ferguson, Alexis Sykes, Becca Vandevort, Jim Grozinger (advisor); Front Row - Rusty Black (advisor), Baillie Schnieders, Brooke Westcott, and Lauren Mustain. On October 22 through the 25, 2008, 14 members of the Chillicothe FFA Chapter attended the National FFA Convention in Indianapolis, IN. The students attended many activities while in Indianapolis. The students attended leadership sessions, the career show, college fair, and convention session while at the convention hall. Other activities attended while at Indianapolis were the National FFA Center, Indianapolis Motor Speedway, and PRCA Xtreme Bull Riding. Students also attended a concert featuring Taylor Swift. Local members that attended the convention were Tyler Jeschke, Lauren Mustain, Lauren Dietzschold, Alexis Sykes, Clayton Allen, John Davis, Konner Ferguson, Baillie Schnieders, Ashley Myers, Kelton Diggs, Jake Meyers, Becca Vandevort, Blake Reed, and Brooke Westcott. On October 15, 2008, 77 Greenhands of the Chillicothe FFA Chapter attended the Area II Greenhand Initiation Ceremony in Gallatin, MO. The Area II officer team, lead by President Tyler Dietzschold of the Chillicothe FFA Chapter, conducted the initiation. During the initiation, the Greenhands listened to the 2008 Area Creed speaker recite the creed, watched a slide show featuring Area II Greenhands, listened to the Missouri FFA State Officer from Area II, Aimee Gutshall, speak, and were presented their Greenhand pins during the Greenhand Ceremony. This fall, the Chillicothe FFA is once again involved in a shooting sports discipline – trapshooting. With the help of the Chillicothe School District, school administration, and the Missouri Department of Conservation, the FFA is teaching students the self-discipline and responsibility of shooting sports. The objectives are to involve students in the highest standards of safety, sportsmanship, and ethical behavior, along with safe and responsible use of firearms. Additionally, the program helps to develop self-confidence, personal discipline, sportsmanship, and teamwork. The students were required to pass the Missouri Department of Conservation Hunter Education program and attended one of the safety meetings sponsored by the Ag Education Department. Recently, the chapter attended a trapshoot sponsored by the University of Central Missouri at Warrensburg. The university has a school shooting facility on their university farm. The students enjoyed the day and learned a lot about competition. The Chillicothe FFA Chapter team had 17 individuals that traveled to Warrensburg and they had one squad that placed 3rd out of 56 squads that participated that day, also, one of the members place in the top five as an individual. The members of the team are looking forward to more events. CAPTION: Members of the Chillicothe FFA that traveled to the UCM Trapshoot. Front row – Austin Cassisty, Nick Koeing, Kyle Ulmer, Lance Surber, Jake Englert, Brooke Westcott, Matt Gillilan, Matt Goll; Back Row –Amber Kieffer, Jacob Ballard, Tyler Dietzschold, Lance Williams, Derrick Scott, Travis Swank, Dalton McMullen, Trevor Meyers, Kayleb Berry. 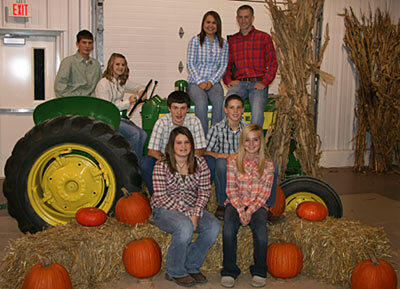 On Saturday, November 1, 2008, the Chillicothe FFA held its annual Barnwarming festivities. These festivities included a dance, games, a hay tunnel, and the coronation ceremony. This year’s 2008 Barnwarming King and Queen are Ben Radcliff and Meredith Jones. The Seniors Class, candidates – Meredith Jones (daughter of Charles and Sherry Jones) and Ben Radcliff (son of Steve and Betty Sue Radcliff) raised $7,023.63 with an average of $163.34/person; Juniors, Emily Sallee (daughter of Jan Sallee) and Jared McCauslin (son of Dewayne and Janet McCauslin) raised $4,637.24 with and average of $115.93/person; Sophomores, Maycee Hoover (daughter of Mark Hoover and Kimbra Mullenix) and Jesse Riddle (son of Jason and Mary Jo Riddle) raised $2,715.75 with and average of $69.63/person; Freshmen, Dani Moore (daughter of Tammy Moore) and Tanner Thompson (son of Genelle Barnett) raised $4,771.00 with and average of $59.64/person. The chapter raised $19,147.62 this year for the chapters operations that average out to $94.79/member. It is Chillicothe FFA Barnwarming Time Again! 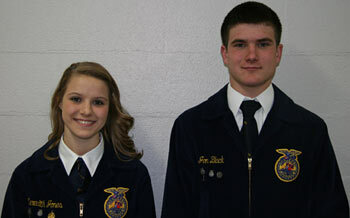 The Chillicothe FFA has selected its King and Queen Candidates for the 2008 Barnwarming. These individuals will lead the charge in the fund raising efforts of the Chillicothe FFA members. The FFA members are now available to do your odd jobs around the house and farm. Give them a call and they will organize a work team to help you in your fall cleanup activities. The class that averages the most money per member will have their candidates crowned King and Queen on November 1, 2008 at the annual Barnwarming Dance. The candidates are as follows: Seniors, Meredith Jones (daughter of Charles and Sherry Jones) and Ben Radcliff (son of Steve and Betty Sue Radcliff); Juniors, Emily Sallee (daughter of Jan Sallee) and Jared McCauslin (son of Dewayne and Janet McCauslin); Sophomores, Maycee Hoover (daughter of Mark Hoover and Kimbra Mullenix) and Jesse Riddle (son of Jason and Mary Jo Riddle); Freshmen, Dani Moore (daughter of Tammy Moore) and Tanner Thompson (son of Genelle Barnett). The chapter has set a goal to raise $19,000 this year for chapter operations. If you have any type of job please give an FFA member a call or call one of the advisors at the Grand River Technical School at 646-3414. CAPTION: Chillicothe FFA members gather around a truck donated by Barnes Baker Motors for the FFA chapter to use this summer. The FFA members expressed their appreciation to Barnes Baker for the use of the truck. Several members are also holding plaques of various awards individual members and the entire chapter received over the summer. 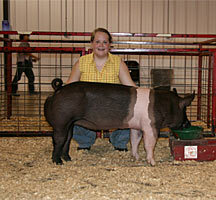 The Chillicothe FFA Chapter received the Swine and Poultry Sweepstakes Award during the 2008 Missouri State Fair. 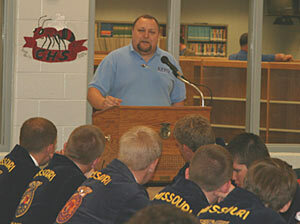 CAPTION: Chillicothe FFA Chapter held their annual the August meeting last (Wednesday) night, August 27, 2008. The meeting was held at the Chillicothe High School commons and served as a new member orientation. FFA advisors report that there are 95 new members to the local chapter and there were approximately 320 parents and FFA members at the meeting. Attendees enjoyed the FFA opening ceremonies presented by the Chapter Officers. The group was then broken into two groups, one being parents and one being students. The parents were given an overview of what to expect being an FFA parent. The students group participated in mixers, watched a skit, and got to ask questions of the officers. Students in the Chillicothe FFA Chapter are from Chillicothe, Bosworth, and Southwest. INDIANAPOLIS, IND. - Ethan Beck (son of David & Suzi Beck), Geana Gates (daughter of Gil & Karen Gates), Wade Judy (son of Richard Judy & Wendy Wilson), Rebecca Kerr (daughter of David & Brenda Kerr), Clifton Lauhoff (son of David & Janet Lauhoff), Shelby Moss (daughter of David & Debbie Moss), and Andrea Williams (daughter of David & Carla Williams), members of the Chillicothe FFA Chapter recently received the American FFA Degree. Earning the degree means these individuals are one of a select group to be recognized for years of academic and professional excellence. The honor was presented on October 25, 2008 at the 81st National FFA Convention held in Indianapolis, IN. The American FFA Degree recognizes demonstrated leadership ability and outstanding achievements in agricultural business, production, and processing or service programs. To be eligible, members must have earned and productively invested $7,500 through a supervised agricultural experience (SAE) program in which they start, own, or hold a professional position in an existing agriculture enterprise. Recipients must also make it their mission to demonstrate outstanding leadership abilities and community involvement. Each award recipient receives a gold American FFA Degree key, and certificate in a blue leatherette frame. Of 500,823 FFA members nationwide, Ethan, Geana, Wade, Rebecca, Clifton, Shelby, and Andrea were seven only 3,341 to be recognized in 2008. Case IH, The Farm Credit System, Pioneer Hi-Bred International, Inc. and Syngenta as a special project of the National FFA Foundation sponsor the degree recognition program. Reserve Supreme Barrow went to April Baker. Senior Showmanship went to Chelsea Bridges. Senior Showmanship went to Troy Sloan. On Friday, May 30, 2008 the Missouri Area II Officers held a workshop for chapter officers at the Chillicothe High School. The workshop focused on communication skills and etiquette. The workshop consisted of the Area II Officers conducting opening ceremonies. Then Tom Brand, Farm Director for KFEQ radio, presented the key note address on “Positive Communication about your Chapter”. CAPTION - Tom Brand giving his key note address. The chapters competed in both a rituals contest and a best dressed contest. The rituals contest is to see which officer team can present the official FFA opening ceremonies with the fewest flaws. The best dressed contest is to see with chapter officer team follows the rules of official FFA dress the best. 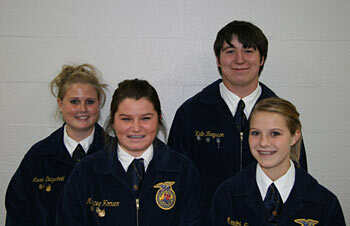 The winners of both contests were the Trenton FFA officer team. The workshop session covered the topics of newspaper communications, radio communications, websites, and e-mail etiquette. The presenters for these workshops were - Newspaper Communications - Cathy Ripley (Chillicothe C-T) and Susie Mires (St. Joseph News Press), Radio Communications - Tom Brand (KBEQ) and Janet Adkison (KMZU), Websites - Brenda Fellhoelter (BK Web Works) and Chuck Erke (Greenhills.net), E-Mail Etiquette - Marti Miller (Miller Auction Co.) and Chris Holland (Livingston County Library).